Krugman right on the mark! 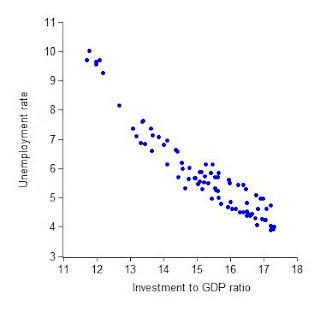 Krugman (and here too) follows on the Mankiw/Taylor correlation between unemployment and investment. Gets causality right, and by updating the data shows that if anything investment is actually kind of strong. We need more autonomous demand, that is, a good old fashioned fiscal expansion, and investment will follow. In other words, this crisis is NOT the result of anti-business bias in government policy. Otherwise investment would be weaker. PS: Note Taylor's reply here. 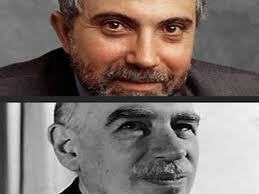 Besides being dense, as Krugman points out quite politely, he gets causality wrong. Yes residential investment is probably, to some degree, autonomous, and, hence not caused by demand expansion (or inversely by unemployment). But the evidence on non-residential investment being determined by variations in the level of output is overwhelming. Thanks to Laura Carvalho for pointing this out! Zingales vs. DeLong: Eccles wins! So Luigi Zingales, from the University of Chicago, said that "the current crisis is not a demand crisis, it is a trust crisis," as quoted in Brad DeLong's post. DeLong replies that "bad government policies certainly produced a trust crisis," and "as a consequence, all across the economy agents cut back on their expenditures on currently-produced goods and services." In other words, this is a confidence crisis that led to a demand crisis. Marriner S. Eccles, the chairman of the Fed during the depression, wrote in his autobiographic book, Beckoning Frontiers, that "confidence itself is not a cause. It is the effect of things already in motion. (...) What passed as a 'lack of confidence' crisis was really nothing more than an investor's recognition of the fact that new plant facilities were not needed at the time." Put clearly, lack of trust is the result of lack of demand. I suppose, in Chicago and Berkeley, Eccles, and common sense, are démodé. Mankiw thinks that the scatterplot below is striking. He should read an intro textbook (I imagine even his text presents the simple Keynesian model). What drives both is the expansion of autonomous demand. Demand increases output, and as per Okun’s Law reduces unemployment. Investment follows the accelerator, that is, as output increases firm’s investment also increases to maintain the relation between productive capacity and income. How is this striking? Europe: Fiscal or External Crisis? It shows that while German unit labor costs remain essentially constant, increasing merely 6 percent, in all the other countries the increases were of the order of more than 30 percent. This translates into significant real appreciation of the real exchange rate in the periphery of Europe. I often tend to agree with Dean, and its no different this time around, but it should be remembered that Volcker not only caused pain domestically with unemployment, he caused the debt crisis by hiking interest rates to the stratosphere. Dean is right that the US will not be Greece, and that common currencies, like the euro (or dollarization in Latin American countries like Ecuador or El Salvador) imply that external imbalances must be adjusted with lower levels of output growth and higher unemployment. But it is important to note that the US will also not be Zimbabwe. Hyperinflation is not about monetization of public debt. The German and Latin American cases show that is about being unable to keep the external value of the currency when faced with a balance of payments crisis. If the US monetizes debt, and the economy is not at full employment, the level of activity should increase. If hypothetically it gets to full employment, monetization of public debt may lead to private agents using money to repay existing debts, to some currency substitution, and to some excess demand (which would force business to invest to adjust capacity to demand). The last two may lead to some demand inflation. Certainly during World War II, when unemployment reached 1.2%, and in the late 1960s, when unemployment fell below 3.5%, some demand pull inflation forces were at work. But Zimbabwe is not related to that at all!!! A good debate on the limits of the deficit between Paul Krugman and Jamie Galbraith. Krugman argues that, although not important now, deficits may translate into inflation. Further, he seems to suggest that insolvency is possible even when debt is denominated in the country's own currency. In this view, hyperinflation (the infinite inflation of Jamie's scenario) would follow. The problem is that hyperinflations (the German in 1920s, the Latin American cases in the 1980s) were not a case of too much money printing resulting from fiscal deficits when the economy was near full employment. The simple explanation is that reparations (Germany) and foreign debt (LA) forced depreciation in order to service foreign (not domestic) debt. This in, in turn, increased the price of imported goods, which led to a reduction of real wages. Wage resistance led to foreign exchange-wage spirals. I formalized a model here (for those interested). 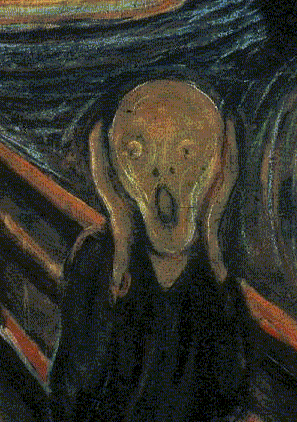 Paul Krugman picked up on Greenspan's latest nonsense at the Council on Foreign Relations. But..I actually WATCHED Alan on CSPAN in the mid o' the night. I know, I know, save it for a beer. The current US capital investment to cash flow ratio is the lowest since 1940. Ok, so companies are piling up cash, not productive investments. Nothing new here. I would suspect a lack of agg demand. Then, and I do need to go read this I 'spose, something like the Godley triple balance thing...as if he discovered it out of whole cloth, its a paper for chris' sake. You know, I down, G up due to stimulus, all else equal. But, says he, this PROVES crowding out! A confused voice from the audience: "Alan, didn't you just say firms have trillions, say 2 or 3, in cash just sitting there? How does that square with G crowding out?" Al: Well, G is obviously sucking up all the S from the private sector, so nothing left to put into I. This is neck snapping. The guy never got beyond Micro 1. As an undergrad. I didn't know how to react. I was embarrassed. This idiot ran the Fed for how long? Even the dog howled. I know this is a bit jargony; write me if you want me to expand/explain. Okun’s Law: Is it broken? 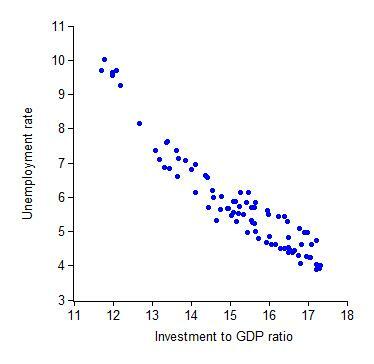 Okun’s Law suggested that an increase in output would imply a fall of unemployment, and the relation was often assumed to be a 2:1 ratio in more recent times. Jon Hilsenrath suggested recently, in a WSJ blog, that the relation is broken. He argues that the average growth between 2007 and 2009, the recession years, was around 2.5% below its trend (the actual growth was slightly negative, around –0.22% in the three years), and that Okun’s Law would have implied and increase of unemployment of approximately 5% (he says little more than 5%, from 4.4% to 8.9%” [sic]), but it increased more, reaching 10.1% in October 2009. That is the basis for the claim that the law is broken. In fact, the average annual unemployment increased from 4.6% in 2007 to 9.6% in 2010, precisely 5%. His fears about the breakdown in the recovery are also exaggerated. What is really surprising is that he thinks that: “unemployment seems to be falling sharply.” I need to find these rosy goggles WSJ bloggers use. I was unable to write the last few days. Too much work, including this paper on the Brazilian economy. I'll get back to the deficit wars soon. This is the link to Matt Taibbi on why wall street bankers should be in jail.